How’s that for a provocative title? As we’ll see, it’s not as crazy as it sounds! In fact, this post is about a semi-recent scientific study that was reported in Nature and Scientific American not all that long ago. My most recent blog post before this one discussed alternative models for the mind/brain problem, or the “hard problem of consciousness”, which attempts to answer how conscious, subjective inner experience (i.e. qualia) can arise from unconscious matter. These alternative models assume that consciousness is primary and does not arise from matter. Instead, they hold that the brain acts as an intermediary, or as a reducing valve, or filter, or in a fashion similar to a 2-way radio transceiver. You can poke, and prod the circuitry in a radio as much as you want looking for the source of the transmission, but you’re missing the point until you realize the radio is not the source. The broadcast waves exist separate and independent from the radio. It’s best to realize these are all just meant to be crude analogies to help us start looking at the problem in a different perspective, or from a consciousness-first perspective. So, we shouldn’t take them too far. Of course, all these analogies are opposed to the more popular matter-first perspective, which assumes that the brain produces consciousness, which would be the more natural assumption in the eyes of most. So, the obvious question to ask would be, is there any evidence that trumps one perspective over the other? At this point the answer is no. However, lets look at what one might conclude based on each perspective. If the brain acts more like a filter one would expect that if the filter is “shut off” we would have unrestrained cognition, or an enhancement in perception. Near Death Experiences seem to confirm this, but the jury is still out. On the other hand, we would expect the opposite if the brain produces consciousness. Under this model, the more intense the brain activity, the more intense the conscious experience. No brain activity would mean no consciousness, which is the materialistic view of death. Now, let’s apply this to psilocybin – the chemical agent responsible for the intense high, or the intense conscious experience, associated with hallucinogenic mushrooms. 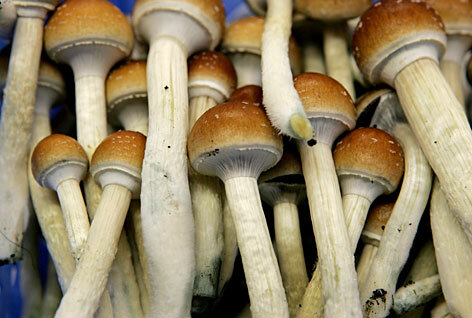 A study was recently done in the UK which investigated the brain activity of folks under the influence of psilocybin. Of course, the obvious expectation in line with the “brain produces consciousness” perspective is that these guys would have their brains lit up like Christmas Trees under fMRI scanners. On the contrary, they found an overall reduction in brain activity, which is in correspondence of what one would expect if the brain acted as a filter, while the psilocybin “loosened” the filter a bit. To be fair, mainstream neuroscience has come up with ideas in an attempt to explain findings like these. One posits inhibitory brain processes in one area allowing excitatory process to grow unchecked elsewhere. However, there was no increased activity found anywhere in the brain during the psilocybin studies. Ultimately, the problem really comes down to the fact that all mainstream theories are unproven and fall short of their ultimate goal. As David Chalmers points out, we have made essentially zero progress in the last 100 years on answering the question of how inner conscious experience can arise from matter. Similarly, the “consciousness is primary” camp isn’t exactly able to say how the brain acts as a filter, or receiver, nor can they definitively point “out there” to some field of consciousness. However, even the Nature and Scientific American articles (referenced below) note the following. As hinted at in the quotes above, there could indeed be a survival advantage to the brain acting as a filter, thereby limiting conscious experience. One does not need to be distracted by other ethereal realms, or angels, while being stalked by a saber tooth tiger! The body evolves within and for efficient function in this world, not the next. The consciousness-first perspective also jives up with the age old wisdom from cultures around the world. I’m currently reading a book by Sri Aurobindo called “The Life Divine”. 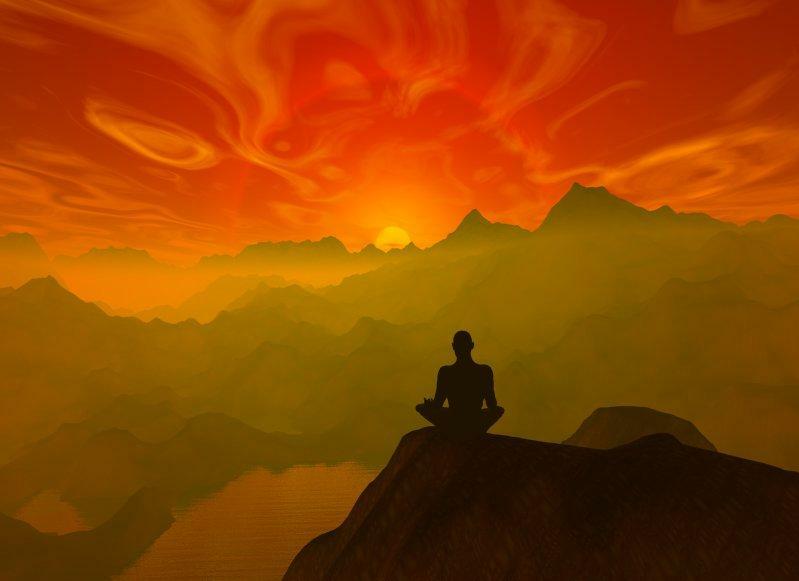 Aurobindo talks about the natural and ultimate state of all things, which is referred to as Sat-chid-ananda. Sat means being, existence, the thing that truly is. Chid means knowledge, or the free, all-creative self awareness of the Absolute. Ananda means Bliss, or Beatitude, or refers to the self-delight which is the very nature of the transcendent and infinite existence. This refers to the original state of unity, which I discuss in my Middle Way, Part II blog post. The idea that Aurobindo puts forth is that this unity is reduced into multiplicity, at least partly, by ego consciousness. One could then view the brain as the house of ego consciousness, or the tool which enables the ego experience, or which filters the state of unity down into multiplicity. How will we eventually know which perspective on consciousness is the correct one? I see this potentially playing out in several ways. (1) A study like AWARE unambiguously shows that consciousness can exist independent of the brain. (2) The accumulating evidence for psi becomes undeniable and perhaps backed up by a compelling theory. (3) Psi and spiritual experiences become common enough amongst the population to where it will become natural to view consciousness as more than just the brain. Or, (4) enough experiments like the one talked about here will make the consciousness-first perspective the more parsimonious viewpoint. In reality, it will probably end up being an interplay of all these factors, plus ones I did not think of, that ultimately bring about an acceptance that consciousness is indeed primary. As you can tell, I do feel fairly confident things will eventually trend in this direction, although I can’t be sure. Factor 4 is very similar to what may be currently happening within Quantum Mechanics. There are two formulations of Quantum Mechanics I have been following: (1) the popular interpretation of QM where time is linear and unidirectional, which is our normal way of viewing time; (2) the time symmetric formulation (TSQM) which has a richer view on time, including a type of retro-causal influence. Although they sure don’t sound like they would be, these two theories turn out to be mathematically equivalent, i.e. they make the same predictions. Therefore, no single experiment can trump one over the other, at least as far as we know. Ten to fifteen years ago, TSQM was not given a high level of consideration. Why evoke such an exotic concept of time when it provides no extra value? Since then, however, a number of modern experiments have been done that are actually more simple and elegant to explain within the TSQM framework, while being convoluted within the standard QM framework. Therefore, more physicists are beginning to find the TSQM framework compelling. But, the jury is still out on which view truly represents physical reality. More on this in a future blog post! Perhaps more experiments could make the “consciousness is primary” model more compelling in a similar fashion. I think all this shows, once again, that it is best for us to keep an open mind on the mind/brain problem, while waiting to see where the evidence takes us. (****) Disembodied Trippers by Bernardo Kastrup, for analysis similar, but superior, to my own. 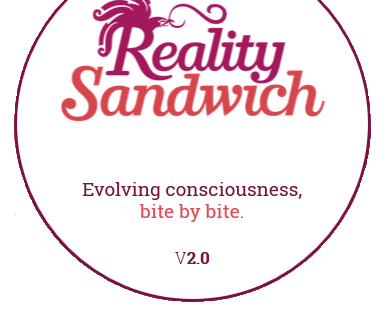 Reality Sandwich Article – Does Consciousness Depend On The Brain? 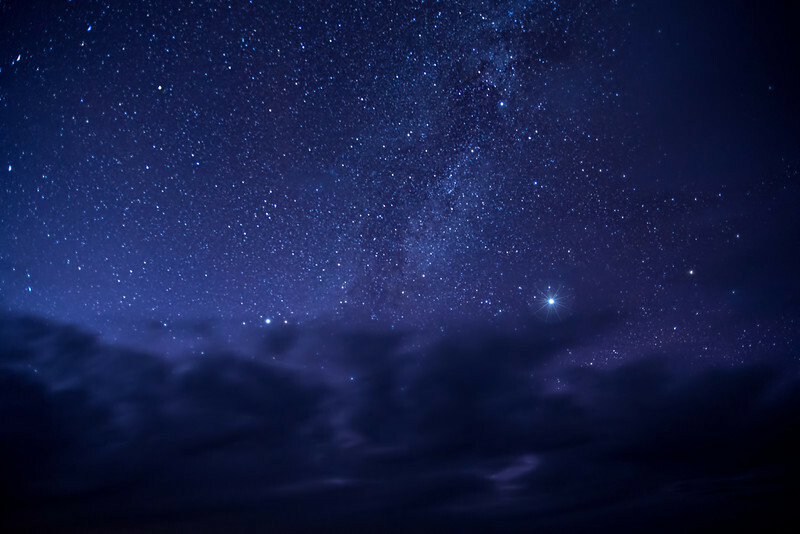 The materialistic paradigm prevalent today has been fantastically successful in giving us our current level of understanding of the Universe, as well as in its contribution to our technological development. Materialism basically holds that everything is physical, or that matter/energy is primary. Another way of saying that is once all physical facts, or laws, are known, a full understanding of all aspects of reality would follow. The current level of success behind this worldview that most of us have been inculcated with since birth, makes it very natural and obvious for us to assume that the brain produces consciousness. 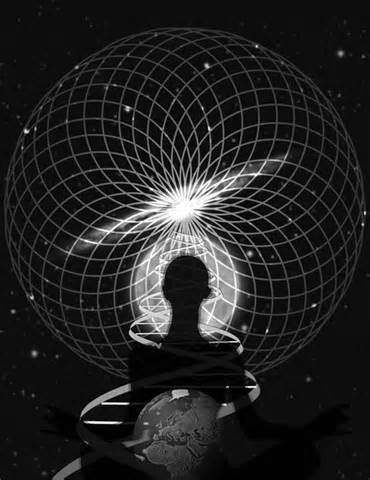 Once all physical facts are accounted for a complete understanding of consciousness would follow, including the “why” behind your loves, passions, talents, etc. ; the “why” behind everyday decisions like whether or not to get the fish taco or burger for lunch; even the “why” behind the inner feeling you get from the color red, or the smell of the ocean, as well as a fundamental explanation of any of the other veritably infinite variations on human experience that is possible. We would have a scientific, mathematical model that could explain all this in physical terms, or in terms of physical laws/facts and, at least to some extent, offer predictions. At least, that’s the idea. However, given that we have no understanding of how conscious, subjective inner experience (i.e. qualia) can arise from unconscious physical matter, it is just that – an unproven assumption. Also, anyone with a historical viewpoint should take caution here. One thing history, specifically the history of science, has taught us is that adamantly and stubbornly sticking to the existing paradigm only guarantees that you will eventually be wrong, despite whatever level of success you currently have. It is also perhaps especially the case the longer you bump your head up against any one problem and fail to explain it under the existing paradigm. Nothing qualifies better here than the problem of explaining consciousness. As David Chalmers points out, we have made essentially zero progress in the last 100 years in our understanding of how subjective, inner experience can arise from physical matter. He coined this “the hard problem” of consciousness. I recently came across an enjoyable article that provided a good discussion on alternative ideas which hold consciousness as primary, rather than matter. These ideas have been around for quite some time and given serious consideration by folks as far back as Hippocrates and as recently as William James. With recent evidence for psi becoming stronger and the prevalence of Near Death Experiences growing, as well as other anomalous phenomenon, these ideas are regaining momentum today. I’ll included a few snippets below and a link to the article found at realitysandwich.com. I hope you find it enjoyable. destruction of brain tissue by disease, or by a severe blow to the head, can impair normal mental activity; the functions of seeing, hearing and speech are correlated with specific areas of the brain. I think it is important to realize that transmission, or TV/radio, is meant to be just an analogy and a rather crude one at that. But, it does help to point us in a direction where we can start viewing the mind/brain problem from a different perspective. 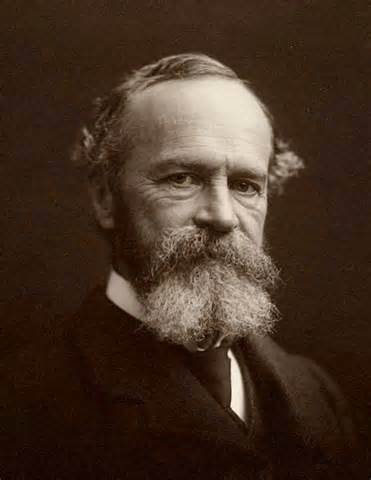 A perspective that as William James pointed out is just as valid as the standard “brain produces consciousness” perspective. At this point one idea is no more supported by evidence than the other. It has been suggested to think of consciousness more as a field found in Quantum Field Theory, with the usual non-local properties, however this too is just an analogy. Psi evidence seems to suggest consciousness is capable of obtaining information in ways that the usual fundamental forces, as modeled within QFT, would be unable to provide with the typical conventional signals. We also know that QFT is an incomplete theory and that the field perspective is probably not a fundamental picture of reality. The perspective of holding consciousness as primary does not negate materialism, nor does it require us to throw out any existing physics. On the contrary, it would only show that materialism is a limiting view, like all human views, but still entirely valid within its domain. Likewise, we would only need to extend physics, similar to how Relativity is an extension of Newtonian theory, which is still also valid within its domain. And, so, I still contend that is best for us to keep an open mind and not commit ourselves solely to the idea that “brain produces consciousness“. Reality Sandwich – Does Consciousness Depend On The Brain? On the weekend before Christmas week, I decided to head out to Death Valley. The only thing feeling more haphazard, disorderly and confused than me on this trip was the weather. I felt scatter brained from the start. It seemed like I was constantly fumbling with gear I couldn’t find, or forgot altogether. Not only could I not decide on what to do and where to go, I would ultimately fail to reach the destinations I finally picked. Still, I enjoyed riding the whirlwind, which ultimately purged me of my stresses and scatter-brained tensions, allowing me to relax into the next two and a half weeks I had off. 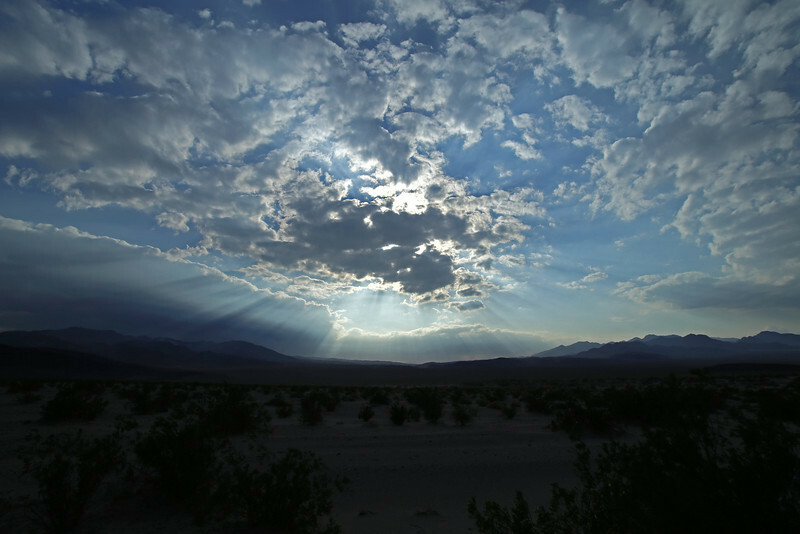 For one of the sunniest places on Earth, the skies and lighting could not have been more dismal over Death Valley. 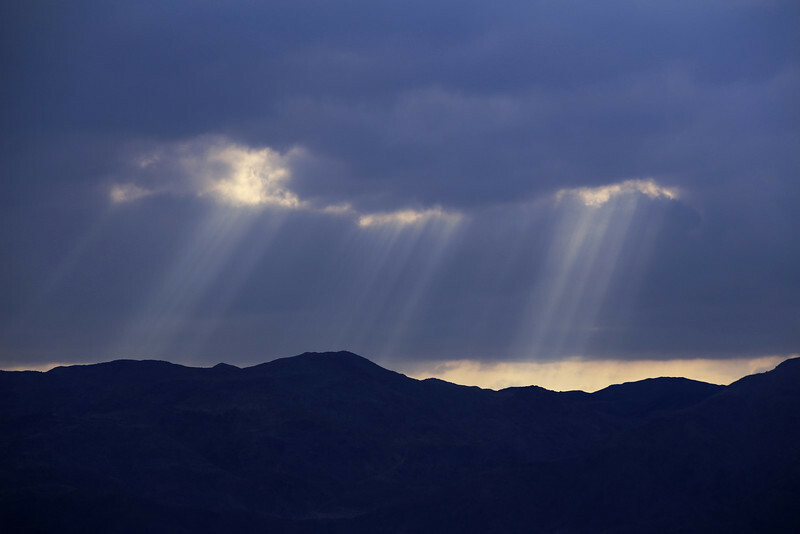 But, the sun would not give up, momentarily breaking through the gloom now and then. Likewise, with the stars. I tried to take photographic advantage of each moment. Rain clouds tried to form, dropping a few drops and the occasional odd thunder peel could be heard on the horizon on the first day. After a sunny hike in the morning on the second day, I drove through a snow squall on the way back home over Towne Pass and all around Darwin. 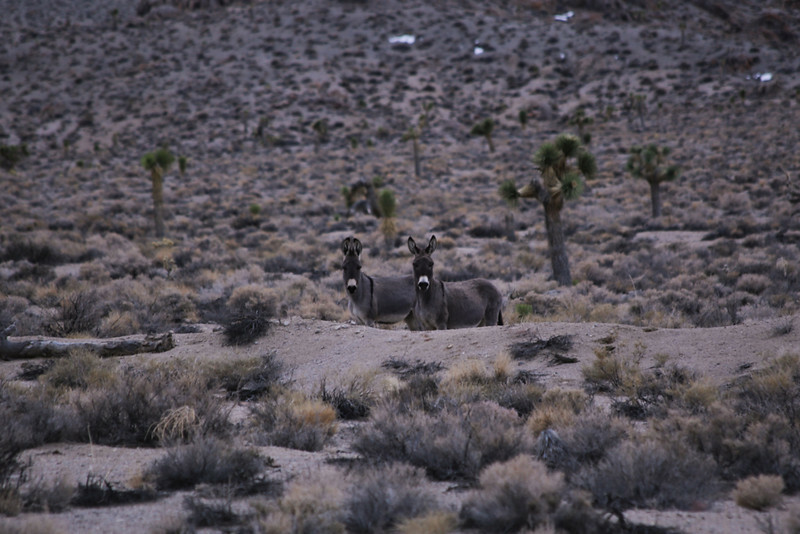 On the drive there, I saw some wild Burros along the 190. They were quite the jittery pair, so they ran pretty far once they spotted me. 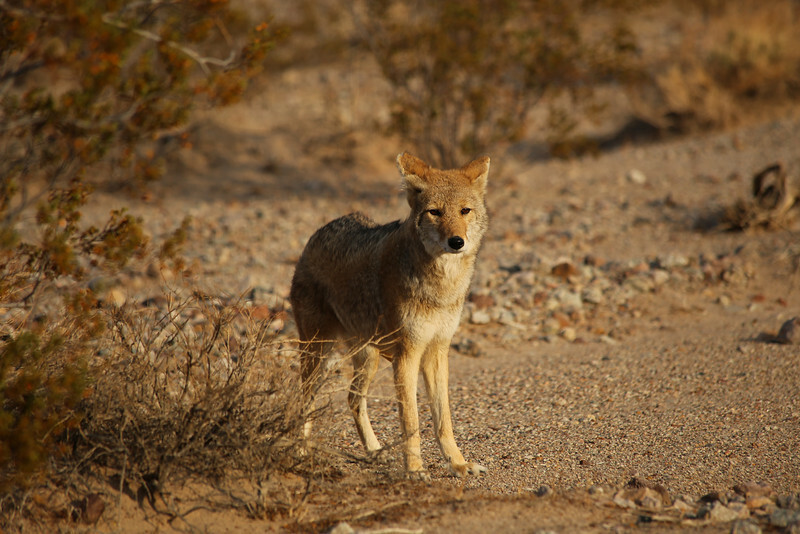 I thought maybe they were the same jittery guys I saw a couple months back along the beginning of the nearby Saline Valley Road, but with one of their companions now missing. Anyhow, add the distance to the dismal lighting and I didn’t get the best photo. Still, I always love a wildlife sighting. As I already hinted at, I didn’t know where to go when I first arrived. The crappy weather had me all thrown off. I ended up parking by Corkscrew Peak and just wandering aimlessly in the desert. An interesting peak eventually caught my eye that I figured must be Little Corkscrew Peak. I decided to give it a go, or more correctly, I was pulled inexorably in its direction like sailors were towards the sirens in the old Greek legends. Perhaps, not an altogether bad comparison, either. Although, I was not crashed to death up against rocks, I was repeatedly cliffed out trying to get to the top, as I “corkscrewed” around the West side of the Little Corkscrew Peak several times. I finally realized what side I needed to be on. With the heavy pack full of my photography gear and my ankle acting up a bit, I decided to save it for another time. I wandered over to a nearby easier peak by following big horn sheep trails which were occasionally littered with their droppings. Since the peak did not have a register, nor was it named on the map, I took the liberty of unofficially naming it Sheep Poop Peak. 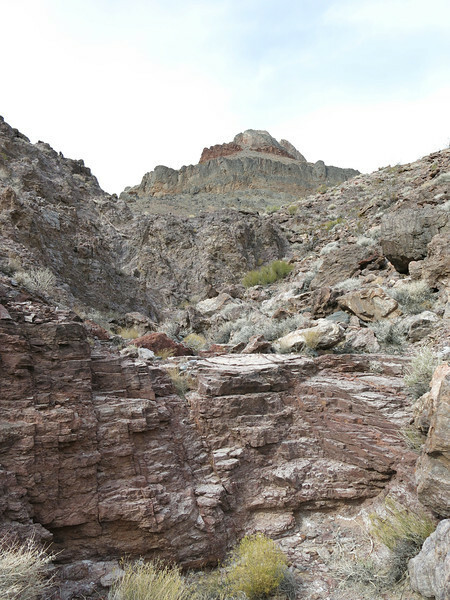 The next picture shows Little Corkscrew Peak above the wash I used on approach to the saddle found on the west side of the peak. Afterwards, I headed up to Dante’s View where I decided to spend the night in my car, taking pictures of the night sky before going to bed and hoping for some sunrise shots in the morning. Neither quite worked out as planned – cloudy skies at night, which somehow amazingly cleared right before sunrise. Still, I managed to get a few fun images. The first is a 30 sec exposure which caught a sunset afterglow no longer visible to the naked eye, as well as adding a cool effect by smearing out the clouds. Just wish the stars were in better focus. 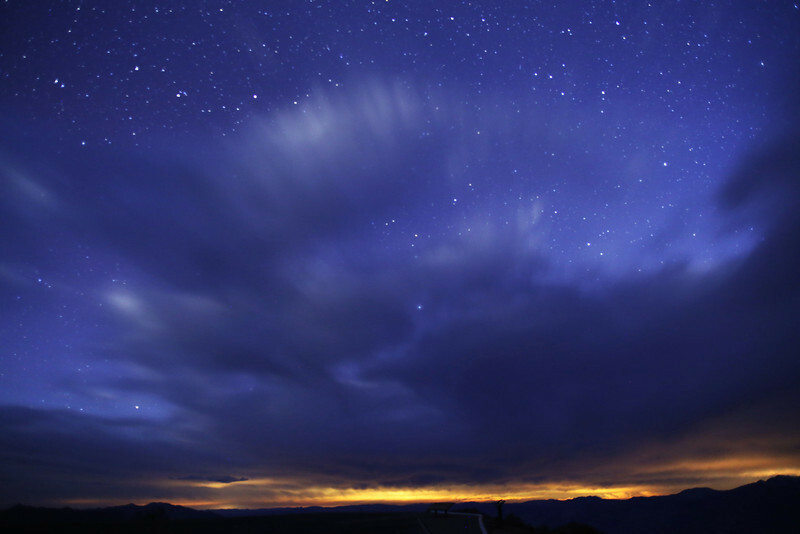 The next image shows the Milky Way and Venus momentarily popping out from behind the clouds. The third is from a failed timelapse of the moon, but I still managed to grab that image out of it. 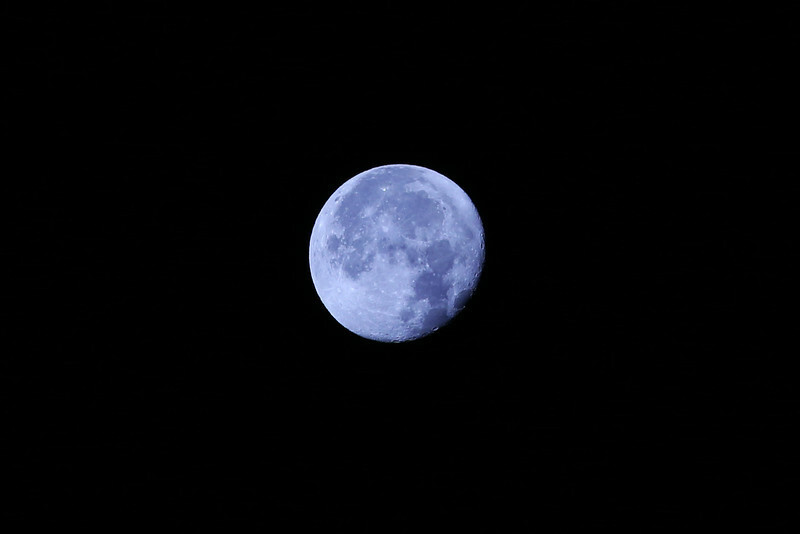 I also tried my telephoto lens out for the first time on the moon. I was pleasantly surprised by how much detail it caught. The following is a crop of a 300mm focal length shot. 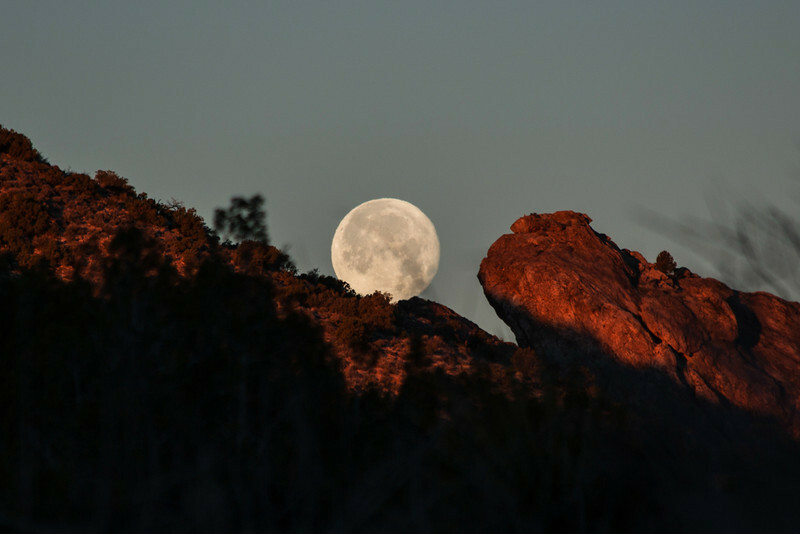 I am excited to try more moonshots, with either something interesting in the foreground, or during a moonrise in the east while the moon is buried in the pastel colors shortly after a sunset. 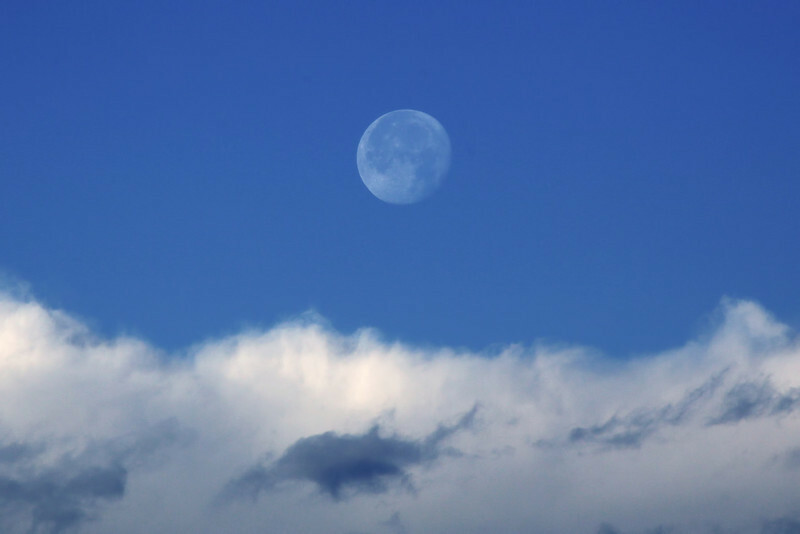 Since the sunset fizzled the following morning, I ended up taking more pictures of the moon as it set into an ocean of clouds above the Panamint Range. I was surprised by the wide range of camera settings (shutter and aperture) needed to properly expose the moon in different conditions. Get it wrong and no details of its surface show up. I definitely still need some practice. For day 2, I decided to try and find the “secret” Kaleidoscope Canyon, since it was supposed to be a great spot for photography. The canyon walls are apparently covered in rocks of various colors similar to Artists Pallet. Since the sun managed to peak out during the morning, I figured conditions might even be good for capturing the colors. 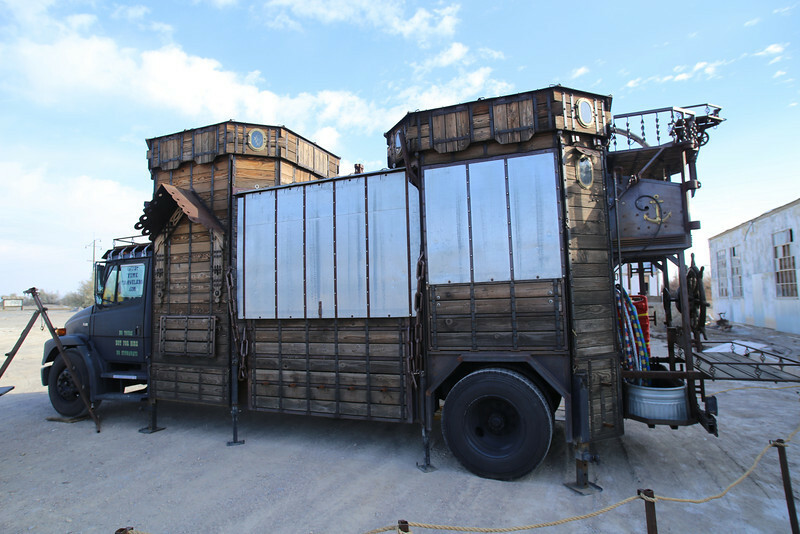 On the way to the Canyon, I came across the Time Traveling Gypsy Mobile at Death Valley Junction. I seriously thought about trading in the 4Runner for this thing. Kaleidoscope Canyon is called “secret” because guidebook authors have left it out of their books for now and folks who have managed to find it have, so far, stayed mum on the location. I gathered a few vague hints on where it might be, studied the map, picked a potential canyon and loaded it into my GPS. After hiking up the initial wash for two miles, I was about to turn into the canyon (then, still out of sight) I suspected was the correct spot. As I turned the corner, I found …. nothing! I was a bit shocked I had guessed wrong, so I guess my over-confidence was a bit unwarranted. I decided to try the right branch to this canyon, as well, but as I came around each turn I was greeted with another view that looked nothing like the impressive Kaleidoscope was supposed to look. I felt like I was getting sucked further and further back into the mountains as they kept showing me something around the next corner that tantalizingly looked like it might be the location of Kaleidoscope canyon but, in reality, was not. I decided to stop playing the mountains games and I eventually gave up and turned around. Besides, it was supposed to be found much closer to the road than I was at that point. It was still a great hike in a pretty area with lots of solitude, though. I’m cautiously optimistic I know where the canyon is for next time! I ran into this cute little guy on the way back to the car. He also wouldn’t let me photograph his little “secret” – the vibrantly colored topside of his wings. 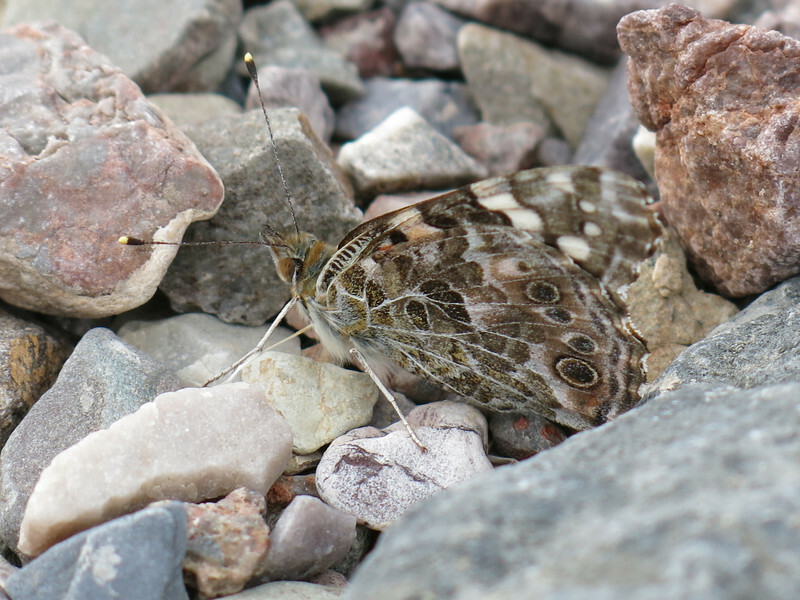 Apparently, when threatened these butterflies pinch their wings together, revealing only the bottom sides, which blend perfectly into the surrounding rocks. Seems like the desert often tries to hide its colors, but it can be quite a beautiful sight when it finally reveals them. You just have to be lucky enough to be there with your camera in the right place at the right time. I hope I have a little more luck on the next trip! I could tell I was a little out of shape, because the hike sure made me tired, but it felt great to get the needed exercise. After relaxing by the car and enjoying a beer, I started to drive back up towards Bad Water along the southern end of the park. Near Jubilee Pass the sun struggled to break through the clouds again, finally succeeding as I got down to the valley floor. I saw several coyotes one other time while coming through here. On the off chance that I would see them again, I grabbed my telephoto lens and got it ready. Sure enough a couple coyotes were hanging out along side the road in what seemed like the same spot as last time, or at least very close to it. 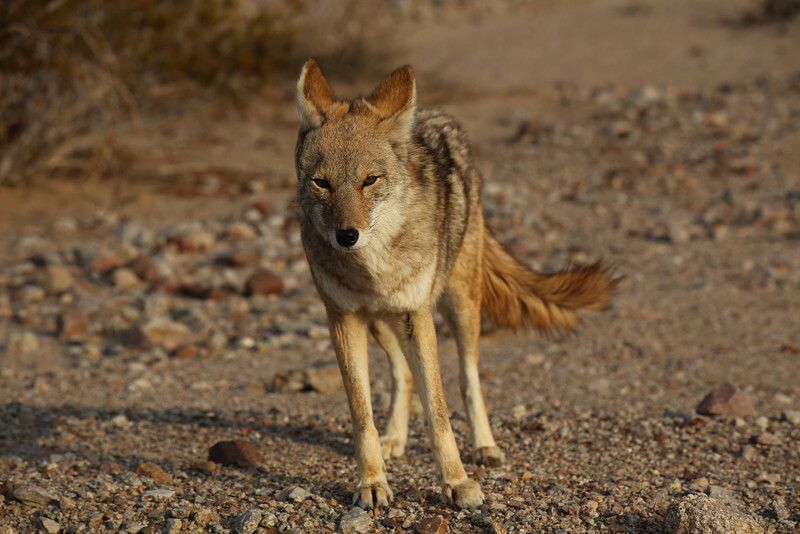 One of the coyotes was not very shy and would get fairly close to my car. His companion was more shy and hung out by the bushes some distance a way. It was pretty obvious they were looking for food handouts, which I resisted giving them. 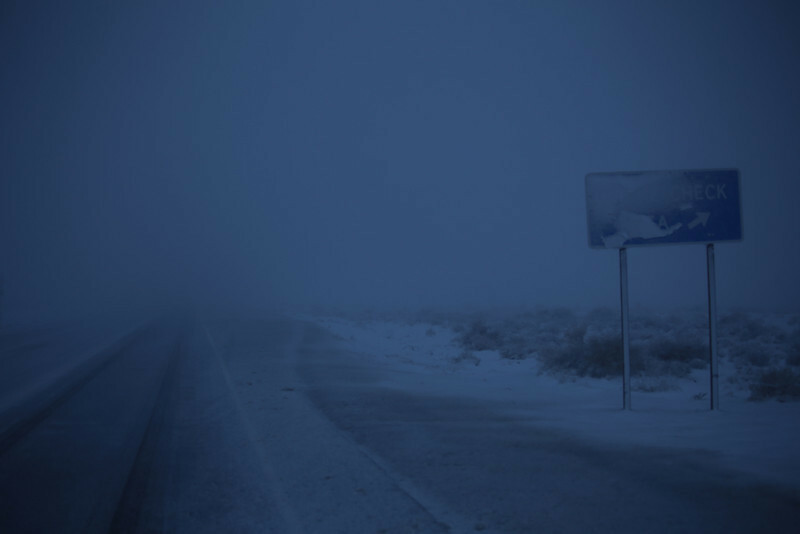 Once again, the weather couldn’t make up its mind and the drive home over Towne Pass and the next pass to the West near Darwin had me driving in the snow. I got out to take a quick picture at Towne Pass and discovered that the temperate had sure plummeted, brrrrrr. A great trip, overall. Check out the rest of my photos on SmugMug. 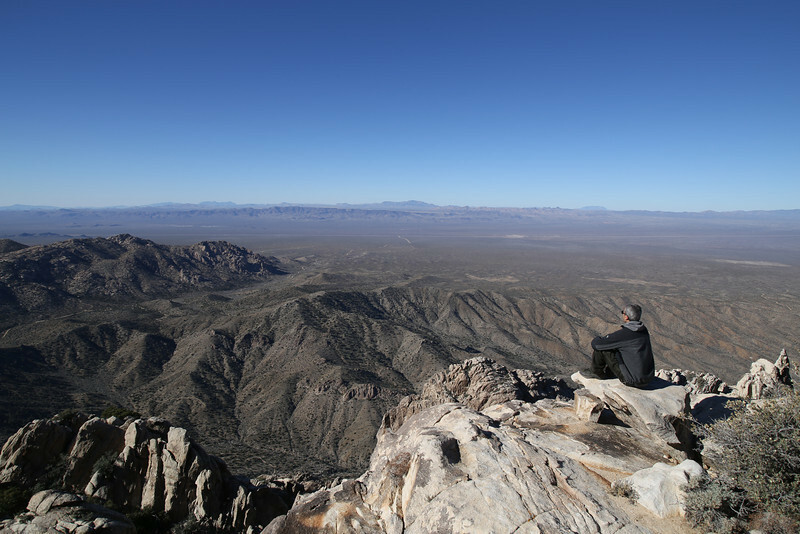 The weekend of January 18th, 2013 had me once again setting off for another remote corner of the desert. The original plan was to head out to Searchlight, Nevada and climb nearby Spirit Mountain, which is about (10² + 8²)^(½) miles from Searchlight, as the crow flies, using the Pythagorean Theorem and the fact that one drives south for 10 miles on the 93 before driving east for 8 miles on a dirt road slightly past Christmas Tree Pass to the starting point for Spirit Mountain. 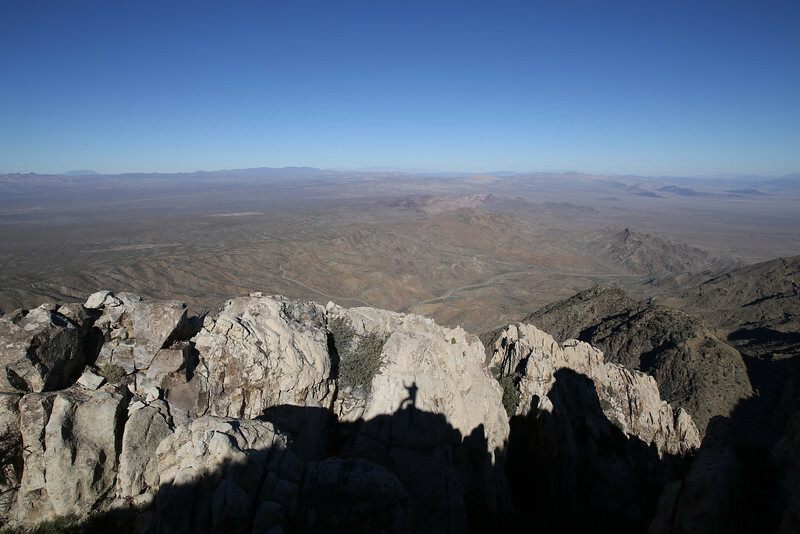 (Yes, this is occasionally a math/physics blogs too) The following day I would climb New York Mountain in Mojave National Preserve. In the end, I was pretty beat after Spirit for some reason, so I tucked my tail between my legs and headed home a day early. Still, I felt quite satisfied, for Spirit Mountain was a great experience. The drive out to Searchlight had me on the Joshua Tree Highway in Nevada. 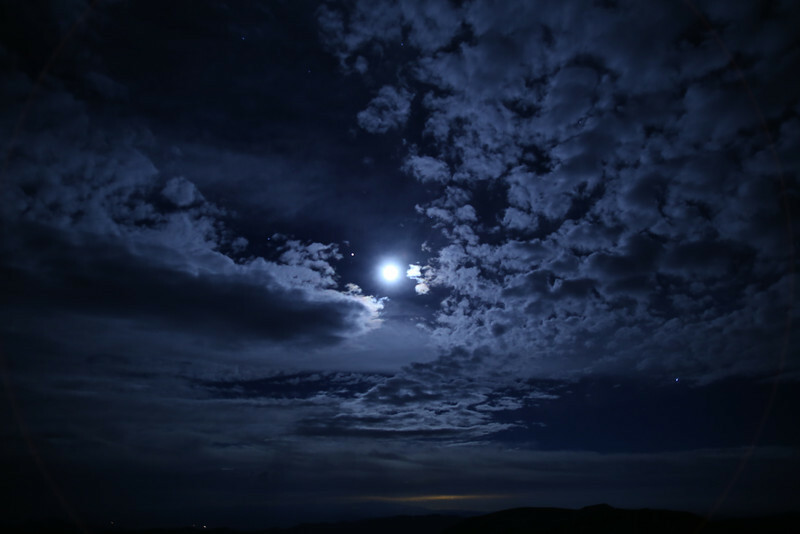 I couldn’t see most of the surroundings which were swallowed up in the blackness of night. Except for a few sections, which had the unmistakable, contorted silhouettes of Joshua Trees, looking like they were reaching out over the highway, as if they were almost trying to grab my vehicle. I blinked and almost missed the entire town of Nipton, CA, which is a place I recommend for filming the next Texas Chainsaw Massacre. Searchlight, NV itself was more than a few blinks of the eye long, but I quickly put that town behind me and was once again heading in earnest across the desert. I was pleased to find the dirt road heading to Spirit was in excellent shape. While driving over Christmas Tree Pass, I noticed the Junipers and Yuccas were actually decorated with tinsel and Christmas ornaments here. This gave me the creeps a bit in the dark, as I pictured some desert loons running around in the middle of nowhere with Christmas decorations, but I appreciated the fun, festive, harmless nature of it later the next day. I finally arrived at Christmas Tree pass a bit after 11PM and crashed in my car for the night, falling asleep to the wind blowing over the pass. 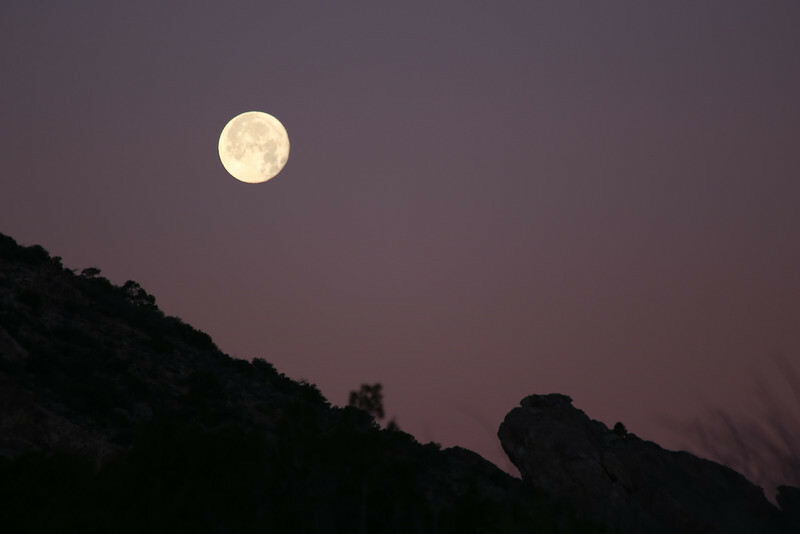 I woke up the next morning to a nice scene of the moon setting while the sunrise lit up the nearby hillsides. The hike starts out for a very short distance on a dirt road, but the route quickly turns into cross country and heads to a small saddle not far from the trail head. The peaceful, beautiful ambiance of the mountain was obvious from the start. 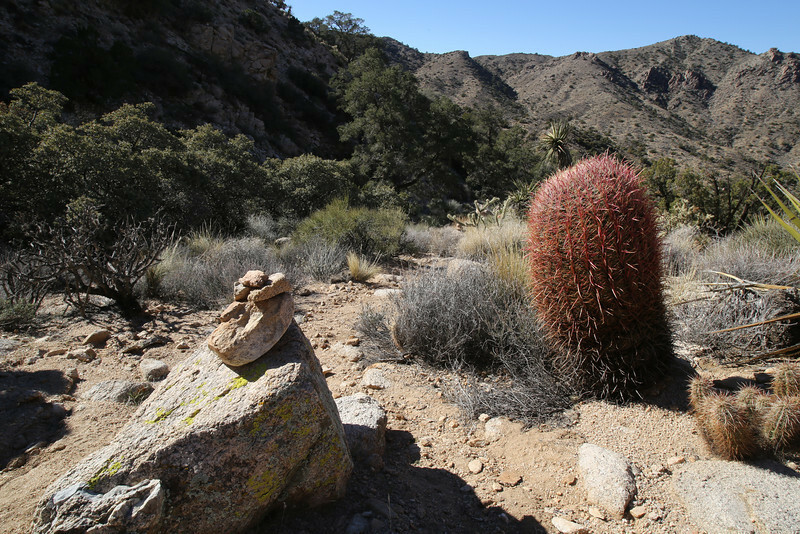 In fact, this mountain is a sacred place to the Chemehuevi Indians. I don’t know exactly why, maybe proximity, or local history, or the fact that the peak looks like it is covered in granite steeples, but just the feeling of the place has to factor in somewhere. Along this initial section were some of the healthiest and robust looking chollas I’ve ever seen all in one place. I was sure it was going to be a cactus-jumping fest to get up the peak, but it was as if a heavenly truce was set up between man and cactus here on this sacred mountain. Or, maybe it was just the small use trail one soon encounters near the base, which avoided the cacti by weaving around and past them. There were also some nice looking barrel cactus along this stretch. 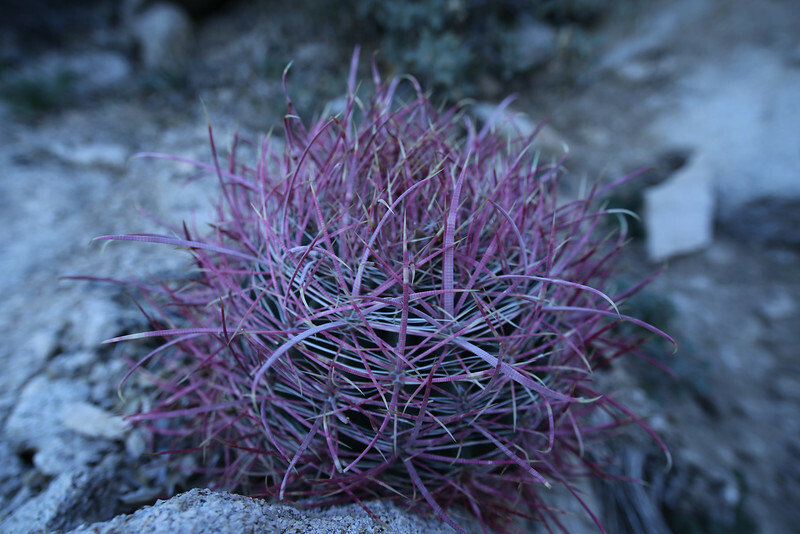 These barrel cactus had a distinctive purple color in the morning shade, but looked bright red later in the day, when the long shadow of Spirit mountain finally retreated under the advance of the noonday sun and allowed daylight to reach the ground here. The use trail leads to a tiny saddle between a small tower and the main massif of Spirit Mountain. From here, one traverses over into the main ascent gully used to get up Spirit by most parties. The use trail was fairly solid throughout this section making for considerably easier travel than it would be without it. Still, the going was steep, gaining a couple thousand feet in around a mile. 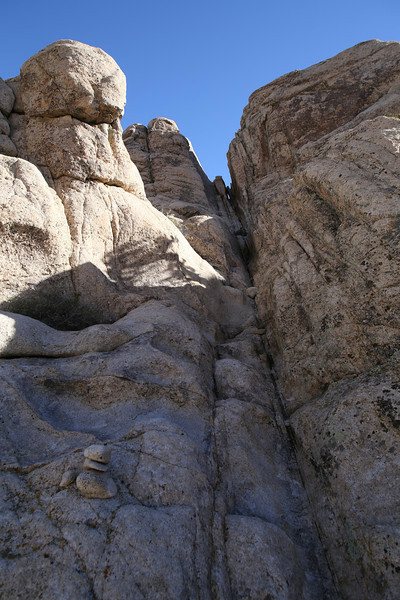 Some Class 2 scrambling was required in a couple sections in addition to the occasional wrestling match with a few bushes. The use trail wasn’t perfect either, so I did manage to lose it for a few brief periods. 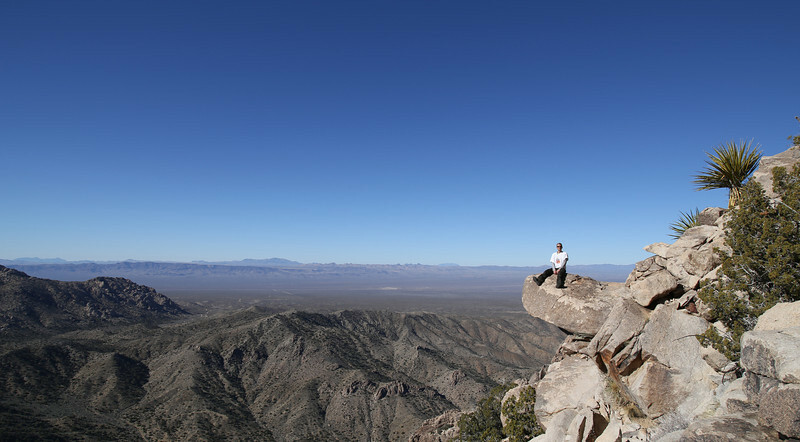 As I climbed higher between granite spires some expansive nice views opened up off to the West. After trudging up the main ascent gully, I reached the summit ridge itself where a short jaunt leads to the summit area of Spirit Mountain. Of course, being on sacred ground, something had to be guarding the summit, which took its shape in the form of a Class 3 section that needed to be surmounted. This was easy enough to climb and I soon found myself on the summit. The views were expansive and I’m pretty sure the photos just don’t do it justice. I humped all my photography gear up there so I had fun playing around with the tripod and taking some panoramas. Those can be seen on our smugmug page (social media button above), but here are a few photos of the summit views. 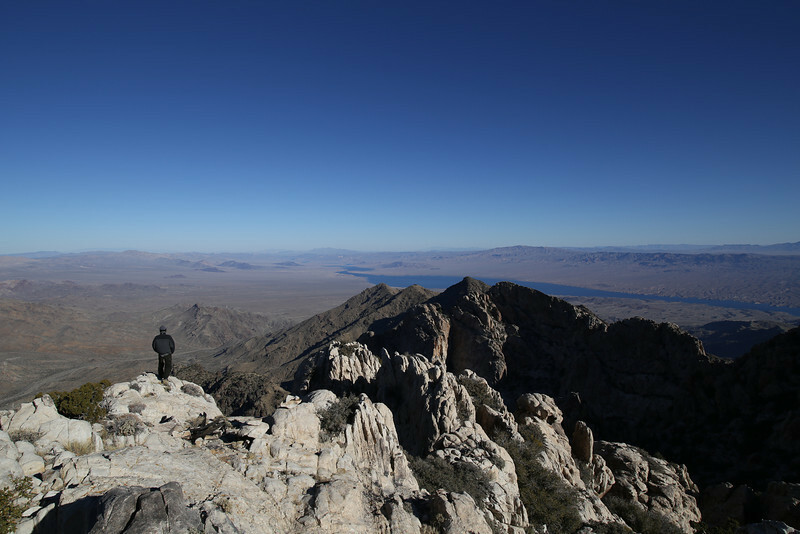 I also wandered over the lower eastern summit to take in views of Lake Mojave down below. I spent probably a good hour up there soaking it all in before slowly making my way back down. Overall the descent was uneventful. I eventually made my way back down to the tiny saddle behind the small tower near the bottom. 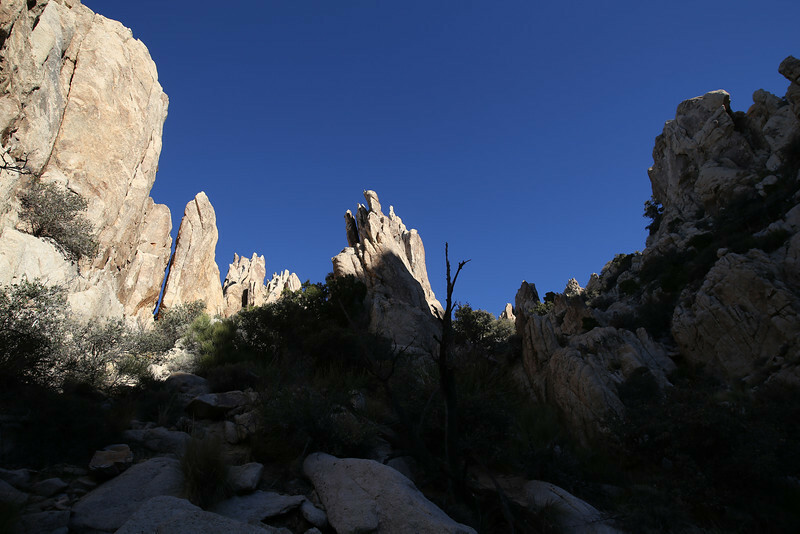 The granite spires were all lit in the daylight now and looked beautiful. It seemed like a perfect place to rest and have a bite to eat. I was cozy for about 2 minutes before a bee decided to come along and harass me. I finished my food pacing around a bit since this little guy wouldn’t stay out of my face. 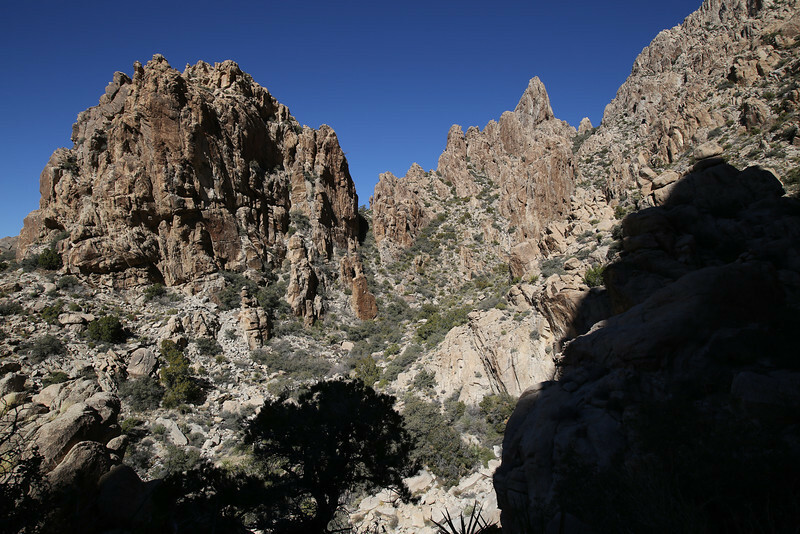 I took one last look over towards the granite spires and continued down the use trail with the occasional behemoth barrel cactus and rock cairn marking the way. On the last little stretch I saw a few big jack rabbits hop away as I walked past the bushes they were hiding in. I relaxed in the back of the 4Runner and enjoyed a couple Hop Notch IPAs from Uinta Brewery my brother-in-law gave us while we were back in Utah for Christmas. I thought I would try and get a few photos of the rabbits before I left, but now that I had my telephoto out they were all gone. Considering it was a 3-4 hour drive back home, it sure went by fast. Great trip! With the Holidays and other distractions, I have been slacking on the blog writing for a little while now. I thought I would ease myself back into it by sharing one of Dean Radin’s recent presentations called “Was Buddha Just A Nice Guy”? I thought it was a pretty neat video, which contained some updates on the latest and greatest in the psi world. Perhaps the most exciting piece of news was on the new meta-analysis which was performed on Dayl Bem’s work of not too long ago. Bem is a respected psychologist out of Cornell that used his repute to get a psi paper published in a respected, mainstream psychology journal. The backlash was pretty fierce. Rumor has it that the most recent meta-analysis puts the effect at 6-sigma, which very strongly indicates, once again, that these psi effects being studied are real. I’ve been thinking about an upcoming blog post that covers Bem’s paper a little more. In the meantime, I hope you enjoy this video by Dean Radin.